Storytelling has long been the cornerstone of marketers’ business. However, without understanding what our firm’s analytical data is telling us, how can we make informed decisions about our future marketing efforts? How does one take the information provided and tell the business leaders the story of how marketing is contributing to the bottom line? Through website, email, and online advertising analytics, that’s how. Use your firm’s metrics to tell the story to your internal audiences, and how marketing campaigns are impacting prospects and customers – and back your story up with real-time data. This approach helps you tell a powerful measurement story – one the C-Suite will undoubtedly want to hear — that will demonstrate the power of marketing done right. From this slide deck, gain a better understanding of what your firm’s website, email, and online advertising analytics are telling you. 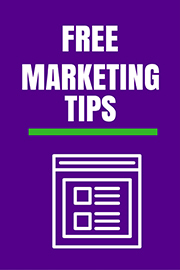 Learn ways to use that information in your marketing efforts. The presentation looks at the website, email, and online advertising analytics landscape to help you become more educated in how, when, where, and what messages your firm should be focusing on for client engagement, prospecting, and more. Learn about the story your analytics are telling you and how to take that knowledge and implement it into your marketing plan, from email marketing to blog post, etc. 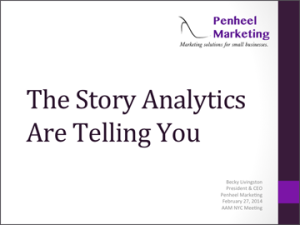 What are you looking to learn about your firm's analytics to help you tell the story?